Using an experienced district energy development engineering and consulting ﬁrm [FVB] can help to ensure plants are correctly designed, reduce development costs, optimize the use of the plant, and maximize energy efficiency. The Community Energy Plant is located adjacent to the Downie Timber dry kilns on Downie Street. This location allows the project to deliver low-pressure steam to the sawmill dry kilns. 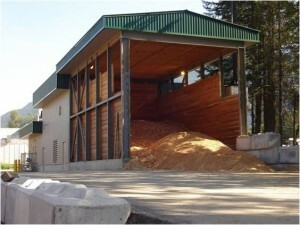 The project uses sawmill “waste” biomass as the primary fuel. A biomass combustor converts this waste fuel into useful steam and hot water. The system produces over 85% of the Customer’s loads on an annual basis, displacing imported propane and cutting 3,200 tonnes of greenhouse emissions per year. 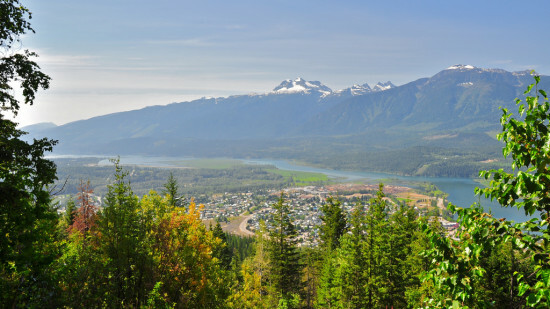 The entire system is owned and operated by Revelstoke Community Energy Corporation, a for profit commercial enterprise that is owned by the City. 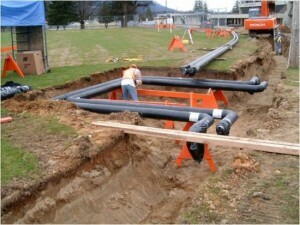 The motivations behind The City of Revelstoke pursuing a Community Energy system were (1) to develop infrastructure in the downtown core that provides highly competitive, efficient and environmentally responsible thermal energy, (2) to utilize the valuable biomass resource otherwise wasted, (3) to reduce local air emissions and cut the city`s carbon footprint, and (4) keep energy dollars circulating within the community. – System started up with an energy center capacity of 3.25 MW (and room for expansion) and 1600 meters of distribution piping (2005).